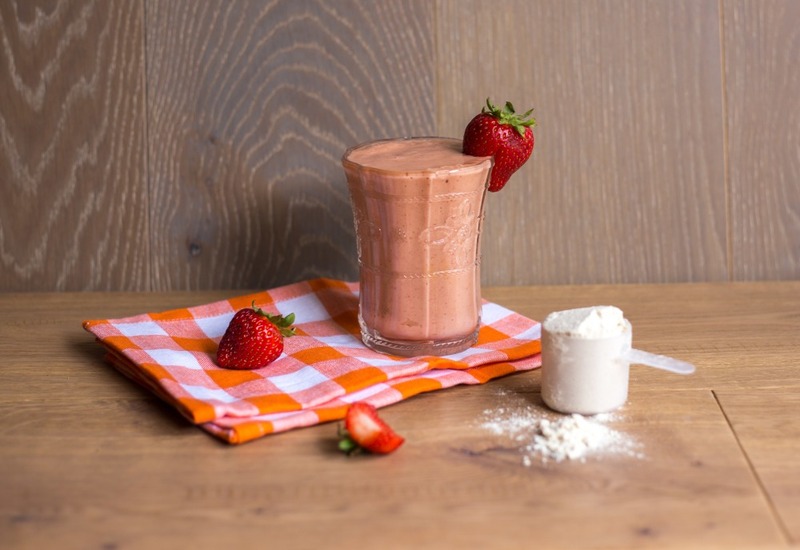 Switch up your usual protein shake with this summery concoction! This healthy smoothie is a perfect post-workout snack or easy breakfast on-the-go for busy morning and takes advantage of peak summer produce. Juicy, ripe peach slices are blended with sweet strawberries and vanilla protein powder for a simple yet filling and delicious beverage. Peaches are full of calcium, potassium, magnesium, iron, manganese, phosphorous, zinc, and copper, while strawberries pack in an impressive amount of antioxidants and vitamins. Adding protein powder is sure to keep you full until lunchtime. If you don't use protein powder, use 1/2 cup Greek yogurt and a banana instead and omit the water. Have trouble finding decent ripe peaches? Use frozen instead. Frozen fruit can sometimes be a better option than fresh because it's picked at peak ripeness. Per Serving: 238 calories; 1g fat; 32.5g carbohydrates; 28g protein; 5mg cholesterol; 55mg sodium. This peach strawberry smoothie is so good! With or without the protein powder, I love to make this. My kids also love it! Sometimes instead of water I will also use apple juice.